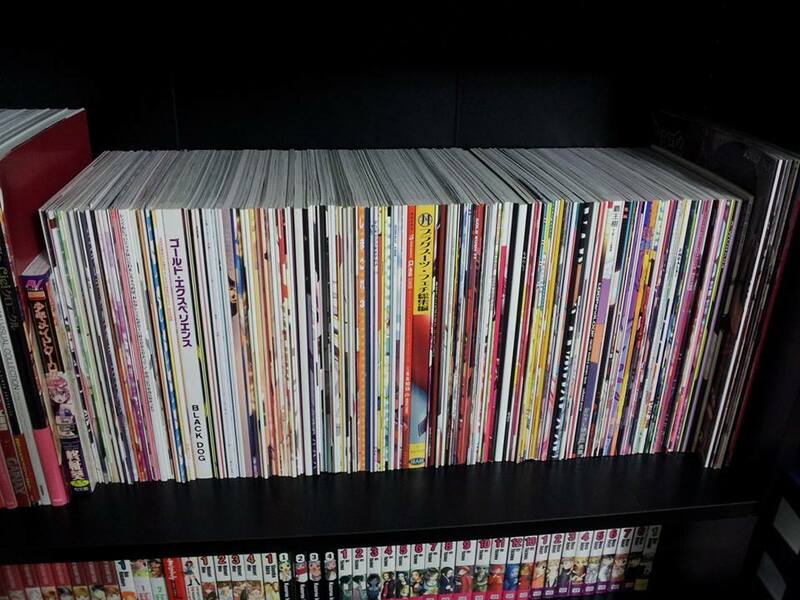 So at this point, I own around 400 doujinshi. Previously they had been organized on a single shelf on an IKEA Billy Bookcase, with no plastic sleeves. However, at a certain point the weight of the books had become so heavy that the shelf had begun to warp and sink down. Fearing the possible worse scenario of the shelf collapsing, and to further protect my collection I set out on a goal of protecting and organizing this ever going collection in the best way possible. First off, I purchased three of ULTRA PRO's Golden Age (pack of 100) Comic Book Bags and three of their Golden Age (pack of 100) Comic Boards. The size of these bags and backings are 7.75 x 10.50 inches, most doujinshi come in a Japanese B5 size which is 7.17 x 10.12 inches, so they fit in the bags and there's a tiny bit of extra room for thicker books. When I got the bags and backings in the mail, I begun the process of transfer my entire doujinshi collection into the bags with backings. To keep the top flap of the bag closed I got some low strength double sided tape, and applied it to the back of the bag so that it wouldn't lift up with the flap when opened. Having the tape stick to the flap when opened is potentially damaging to the doujinshi cover when attempting to be removed from the bag. 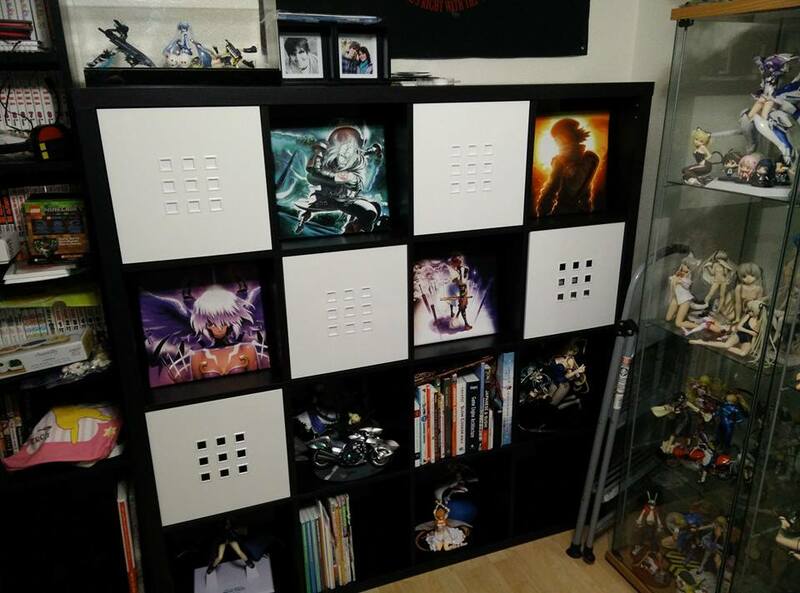 After all the doujinshi was organized into their bags, I needed to new a new piece of furniture to store them in. 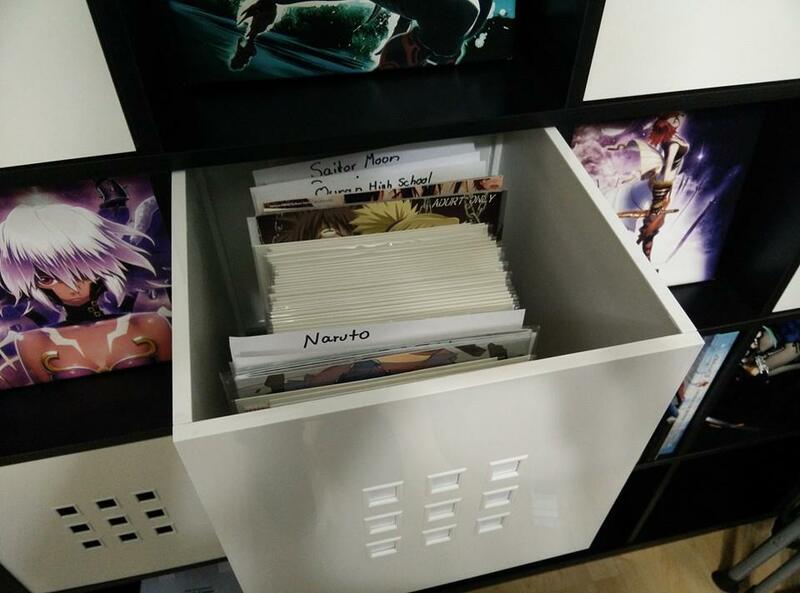 I really dislike the whole pulling doujinshi from a shelf to see which one it is, than sliding it back in. There are too many risks for damage in my opinion. So instead, I wanted to store them in a way where they could be inside drawers and be going through from the top. This makes the process of finding a particular doujin must faster. For this purpose, I went for the IKEA KALLAX storage unit with LEKMAN inserts. After all was said and done, I think it turned out pretty well. After a few years since this post, the collection has grown dramatically. The paper dividers became very bothersome as they would shift around too much when moving things around. Due to this issue, I decided to switch them out for hard plastic dividers that were clearly labeled with printed labels. To accomplish this clean look, I used Ultra Pro's Comic Dividers with labels created using DYMO's LabelManager. 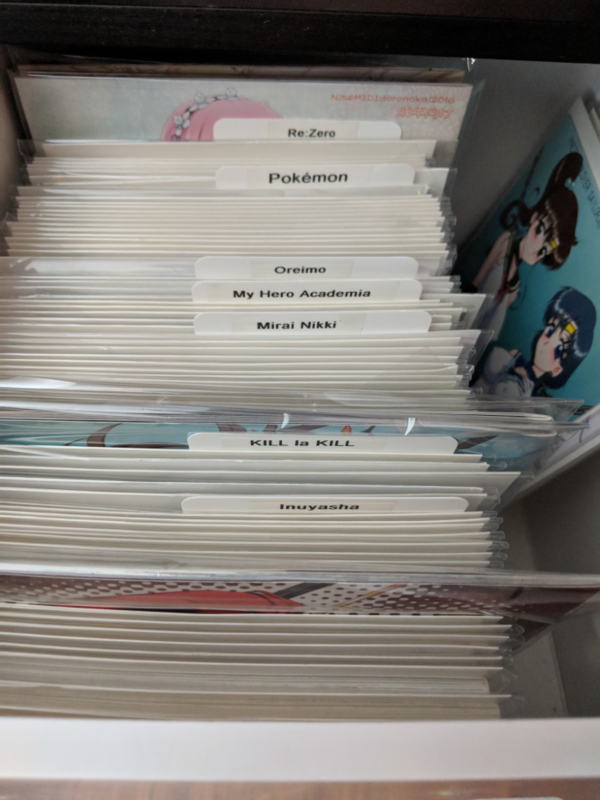 My doujinshi collection continues to grow larger every year, so having a clean method of organizing it all is very important to me. I am pretty happy with how this method has turned out. I have them categorized by parody/series first, then it goes into specific tags and finally into artists. Overall, it's very clean and easy to find stuff now. I'm a web developer who loves to cook things, play video games, and sometimes I post random stupid things on this really pointless blog.